4-7:15pm: Video Screenings of work from Anonymous: Contemporary Tibetan Art will screen at 4pm and repeat at 6pm with an introduction from from guest curator Rachel Perera Weingeist and participating artist Tenzing Rigdol. See video program details below. In Offering, artist Tenzing Rigdol creates a stage-set evocative of a traditional Tibetan interior. Spectators are invited to fill ceremonial bowls with different types of alcohol, produced in countries around the world. The artist will drink from each one, and make personal statements as an attempt to express his idea of being a Tibetan in exile. In this performance, he creates a ritual of his own invention. 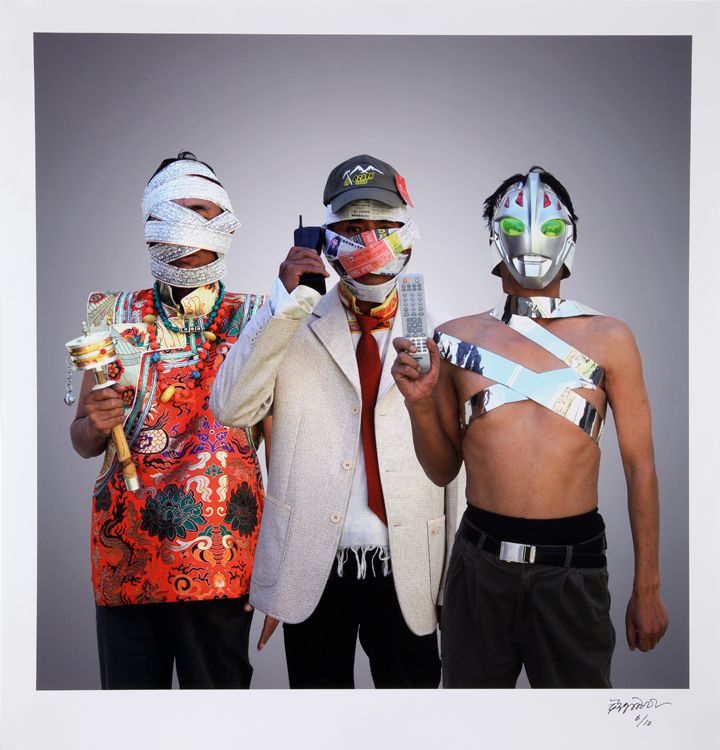 Anonymous is an exploration of changing attitudes towards self-expression, attribution, and identity in contemporary Tibetan art. Traditional Tibetan culture placed little emphasis on individuality or artistic self-expression. Art adhered to a formal system of production to support the transmission of Tibetan religious culture and was, by and large, created by unattributed artists who remained anonymous. However, in the global contemporary market, the creativity of the individual has become the primary basis by which we produce, interpret and consume art. Innovation and novelty are often valued more highly than technique and tradition. Attribution, the artist’s name, has become a fundamental aspect of the work. Within the new social reality as part of the Peoples Republic of China, art is becoming a vital medium of self-expression for Tibetans. Artists are increasingly focused on the experience of the individual and a cautious 21st-century visual language steeped in irony, metaphor and allusion has fully emerged. Embodying the friction between a contemplative art tradition and the need for new ideas and action, Scripture Noodle fuses symbols of both together. A Tibetan pecha (book) is cut up, stir-fried and consumed in a small Chinese fast-food restaurant; this entails the digestion or disappearing of cultural systems to create a different energy, both metaphorically and bodily. Drifting examines environmental concerns and the recent phenomena of tourism. Initially the viewer sees traditionally dressed oarsmen in a Gowa (Tibetan boat), rowing female passengers dressed in western clothing through a pristine landscape. The camera zooms out to reveal an industrial structure with a sign in Chinese. As suggested in the title, their journey doesn’t have a defined end point or goal. In Tibet, development and modernization are seen by many as the by- products of tourism, eroding the traditions, environment, and natural beauty of Tibet. In Self, a succession of young men and women inflate balloons until they pop. On each balloon, the word “self” is written in one of nine languages, including English, Tibetan, Chinese, Thai, Japanese, and Arabic. There is a shared anticipation of the participants in the piece, and those watching it. Through humor, the video addresses issues of identity and language, and refers to the concept of “no-self” or anatman. In Buddhist philosophy, it is believed that a person must understand the non-existence of self in order to achieve enlightenment. The subjects enact this idea, constructing “self,” only for it to blow up in their faces. At the beginning of Landscape Movements, we are presented with what seems to be an aerial view of the earth. As it progresses, a hand pushes earth toward the center of the image with a paint-brush, gradually revealing the outline of an ambiguous topographical map. At the end of the video, five jars are placed in front of the gathered earth”reminiscent of bowls that hold offerings in shrines”alluding to a sacredness inherent to the landscape of Tibet. The shelf on top of the video contains this earth, and has a contemporary altar-like form echoing religious sites. There are many philosophical implications in this poetic video piece. The drying of traditional clothing in a Himalayan landscape bisected by a mass-produced fence, serves as a metaphor for the fragility of people’s lives in the face of modernity, our collective disconnect from nature, and the impact of cultural colonialism. In the course of the film, the clothes are unceremoniously blown to the ground by the wind, suggesting a cruel indifference to the value of cultural tradition. In Matchsticks, the sensitive subject of immolation is addressed. The video piece is a memorial for those, who because of political reasons, cannot have one. In the narration, the date, place and name of the protester are stated. Specifics of each place are narrowed down to a location, often a county, town or city, instead of a prefecture or region. The dorje (a symbol of enlightenment) illuminated by the strike of a match, is an instrument used by lamas in rituals and prayers. It is believed to cut through illusion to reveal truth. Many Tibetans see the immolators as fulfilling this function. Crazy of Silent tracks the progression of a caterpillar, through an endless industrial expanse. Associations with Buddhist enlightenment come to mind, as the insect attempts to get to the sustenance necessary to complete its transformation. The fragmented narrative accompanying the piece is taken from numerous Chinese, American, and Korean news reports. Covering a range of themes, it begins with a philosophical question about why people exist at all. Some quotes reference ideas of freedom, such as Obama’s “In America we make our own destiny.” Along with other works in this exhibition, Crazy of Silent pits industrialization and modernity against nature. Secretly filmed with the use of a hidden camera and fish eye lens, this piece functions as a contemporary portrait of the Jokhang temple, one of the most sacred Tibetan locations, and the main circumambulatory route called the Barkhor. Moving from daylight to dusk, it features a cast of pilgrims, shop-keepers, police, and military. Throughout the route, the camera- person films and highlights”at huge personal risk”the inordinate police and military presence on the street. Without the use of traditional narration, it comments on colonialism, the changing cityscape, and reduction of tradition to commercialism.